The companies which make up the Fortune 500 list are household names creating products and delivering services which are staples in our everyday lives, but what about the CEO’s who shape their direction and run these companies? 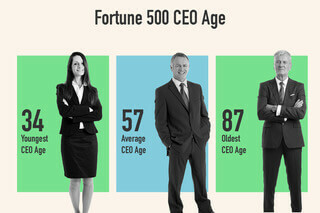 Here at Franchise Opportunities we wondered what the average Fortune CEO looks like and what they have in common. 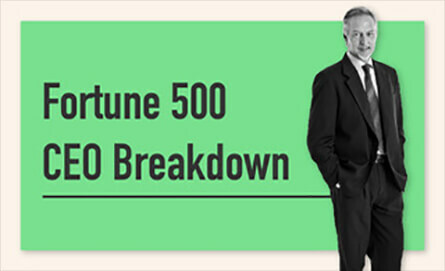 To answer this question we decided to look at CEOs across the Fortune 500 list to determine what the patterns in education, age, gender, nationality, and industry were in order to create the average Fortune 500 CEO. 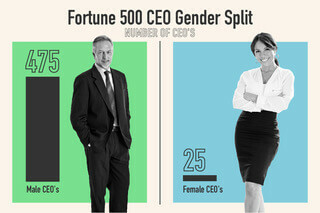 When it comes to gender, males dominate Fortune 500 CEO roles with females making up just 5% of Fortune 500 CEOs. While the youngest Fortune 500 CEO age is 34, the average Fortune 500 CEO age is 57 and the oldest is 87, so no matter how old you are, there’s always a chance of becoming a Fortune 500 CEO. It may be of no surprise that Harvard is the top college for Fortune 500 CEOs with 13 of them having received their education from this most prestigious institute. 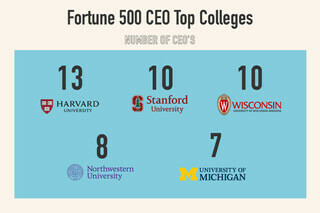 Stanford and Wisconsin rank in second place with 10 CEOs studying here, and Northwestern University and the University of Michigan are the 4th and 5th most popular colleges with 8 and 7 CEOs obtaining their education from here. Looking at the education information available for Fortune 500 CEOs, the most common education level CEOs have obtained is a Master of Business Administration degree with 194 CEOs having obtained this degree. 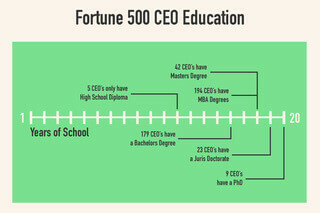 Proving education isn’t the be all and end all, 5 Fortune 500 CEOs only have a High School Diploma showing you don’t need a college education to make it. Nationality wise American CEOs dominate the Fortune 500 list with 372 of CEOs hailing from the US. 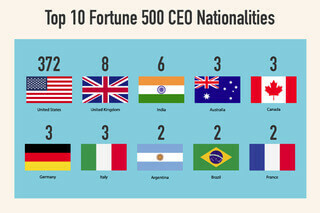 British and Indian CEOs are the 2nd and 3rd most common Fortune 500 CEO nationality with 8 and 6 CEOs coming from these countries. After determining that the majority of Fortune 500 CEOs are American we looked at which states the most CEOs are born in and New York topped the list with a total of 25 CEOs born there. 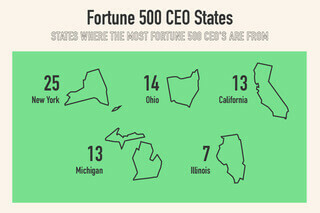 Ohio, California, Michigan, and Illinois comprise the rest of the top 5 states producing the most Fortune 500 CEOs. 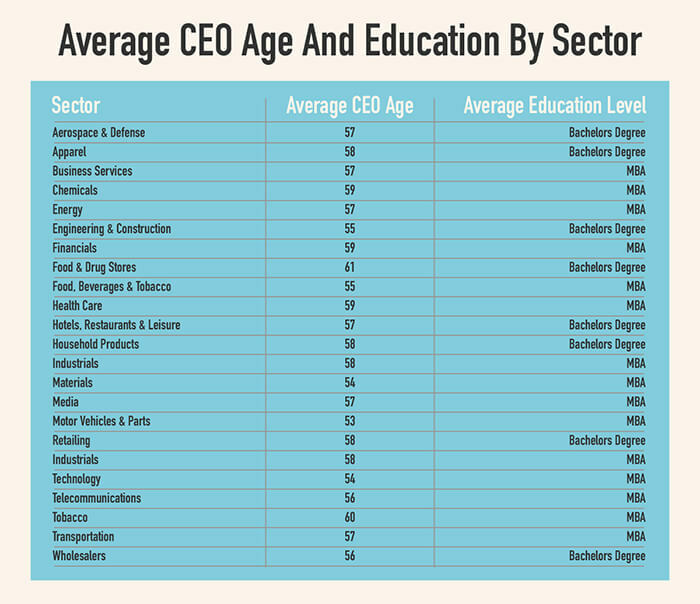 Looking at Fortune 500 CEOs by sector, the youngest CEOs work in Motor Vehicles and Parts with an average age of 53 whereas the oldest CEOs work in Food and Drug Store. In terms of CEO education level by sector, 65% of Fortune 500 sectors on average have CEOs with MBAs whereas 35% have Bachelors Degrees. So there you have it, the average Fortune 500 CEO is a 57 year old American male born in New York and educated at Harvard and holds an MBA. If anything though, this study has shown that age and education level are irrelevant and that individuals can make it to the top with drive and determination so if you don’t fit the average, there's always a chance that you could become the next CEO of a Fortune 500 company.